Built in 2000, the boutique-style, four-star Hilton Times Square has a location on 42nd Street which places it near many attractions, such as Rockefeller Center and Fifth Avenue, along with transportation hubs. The hotel features Zagat-rated dining and a concierge/ticket desk to help guests see a show. Complimentary wireless Internet is accessible throughout the hotel and business travelers can take advantage of 2 meeting rooms that total 500 square feet of meeting space. The Hilton's fitness center includes free weights and exercise equipment. The hotel provides discount passes to New York Sports Club across the street. Security guards are stationed 24 hours per day and valet parking is available for guests. The Hilton's Restaurant Above and Pinnacle Bar provide views of the city for diners. On-site amenities include business center, fitness center and more. Hilton Times Square's 478 guestrooms are some of the largest standard-size accommodations in Midtown at 330-360 square feet, offering sweeping views of Times Square and the Hudson River. Amenities include safe, 37-inch flat lat screen TV, and upscale bedding. Hilton Times Square offers 478 forms of air-conditioned accommodation with MP3 docking stations and laptop-compatible safes. Pillowtop beds feature premium bedding. 46-inch Flat-screen televisions come with premium satellite channels and pay-per-view films. Fridges and coffee/tea makers are provided. Bathrooms include a shower, a complimentary bathrobe, designer toiletries and a hairdryer. 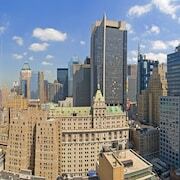 This New York hotel provides wired and wireless Internet access for a surcharge. Business-friendly amenities include desks, complimentary weekday newspapers and telephones. Additionally, rooms include an iron/ironing board and blackout curtains. Housekeeping is offered on a daily basis and hypo-allergenic bedding can be requested. Hilton Times Square has a restaurant on site. Cribs (infant beds) are available for USD 30.00 per night. Pets are allowed for an extra charge of USD 75 per accommodation, per day.